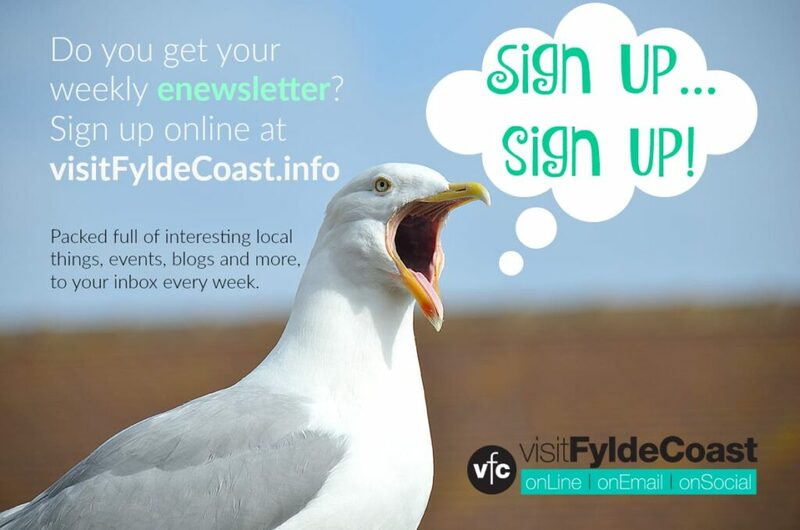 If you go down to the seafront you’ll get a big surprise! 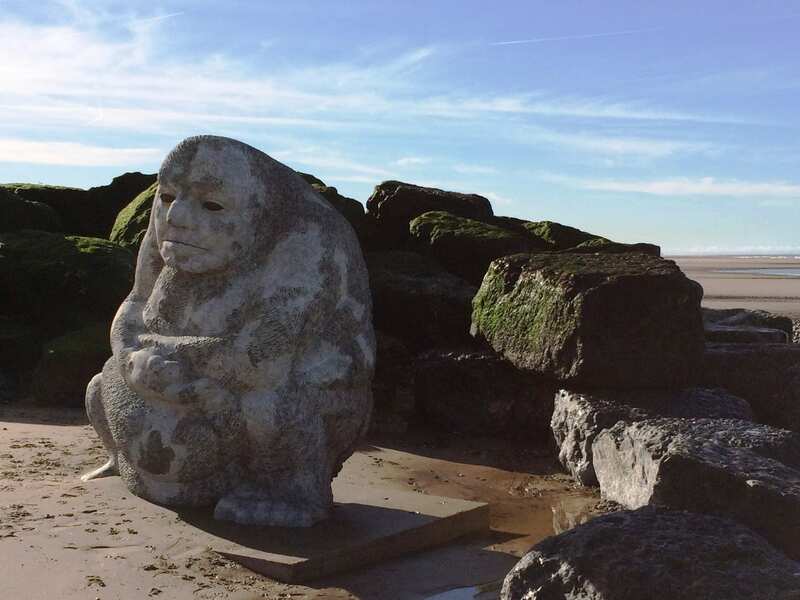 Have you met the stone Ogre on Cleveleys beach – with glowing red eyes! 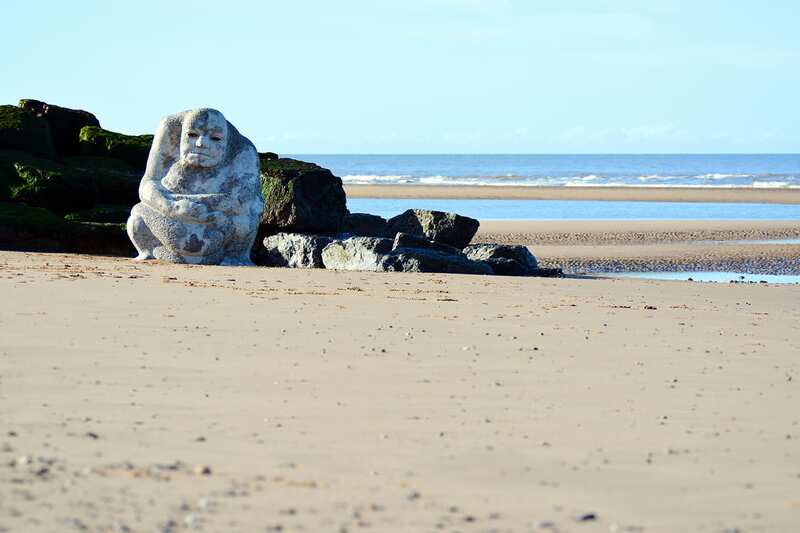 The Ogre is a key feature of the story of the Sea Swallow – the specially commissioned story book which combines local folklore, myth and the legends around Wyre’s coastline. 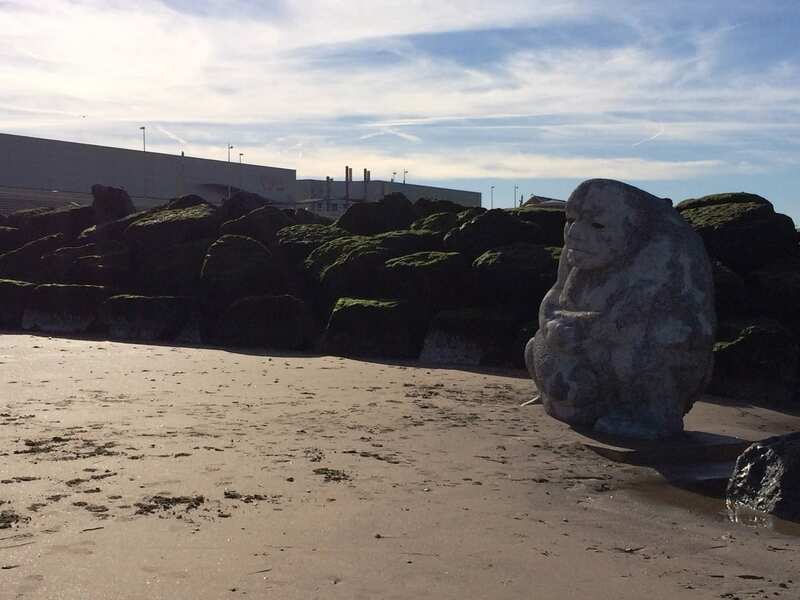 He’s a stone sculpture on the beach which joins the other local pieces of public art that tell a story along our coastline. 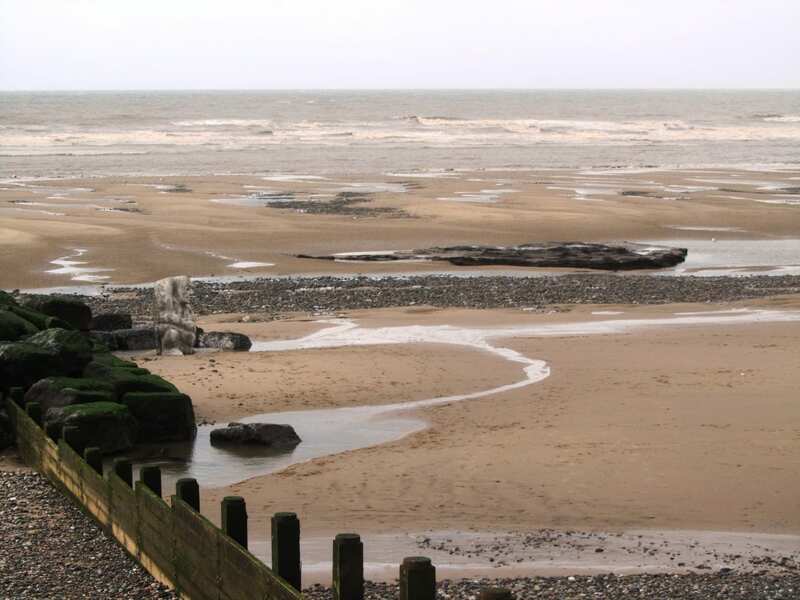 First, where Cleveleys meets Blackpool is the Shipwreck Memorial, next the Sea Swallow, then the Ogres Paddle. Spot the Ogre himself sat on the beach when the tide is out, and finally you’ll see Mary’s Shell . It’s also on the beach but is so big that it’s exposed even at high tide. 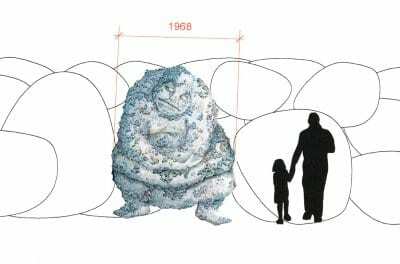 You’ll only see the Ogre when the tide is out – sat on the beach he emerges from each tide.  Have a look at this clip and see exactly where to find him. 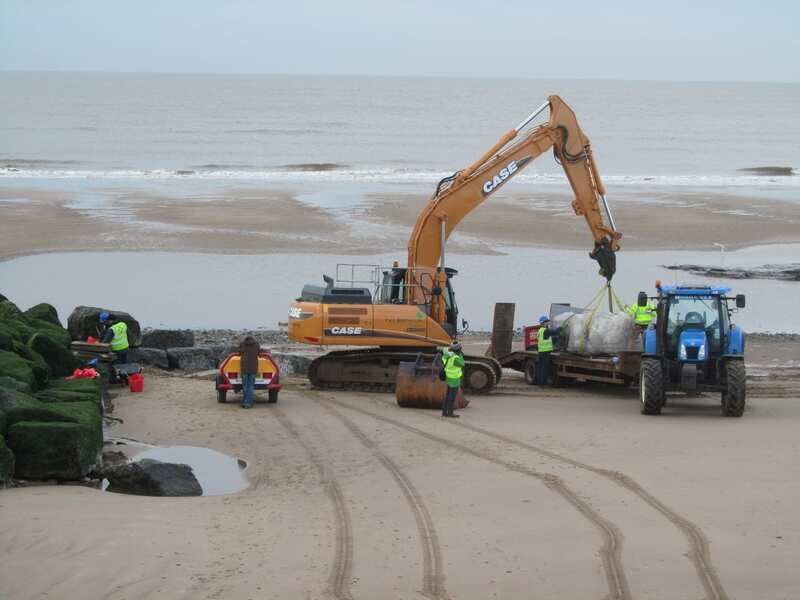 Watch this video of the promenade and beach at the northern end of the new sea defences. Can you spot the Ogre at the end of the Groyne? 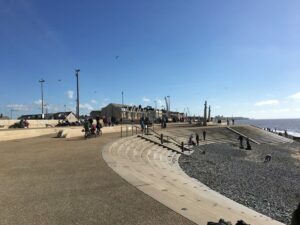 Walk north along Cleveleys promenade to mid way between the cinema and the round cafe building at the northern end of the new sea defences. Stand looking out to sea and at the end of the stone groyne you’ll see what looks like a single big stone, stood slightly apart and to the right of the very end of the groyne. That’s the Ogre. 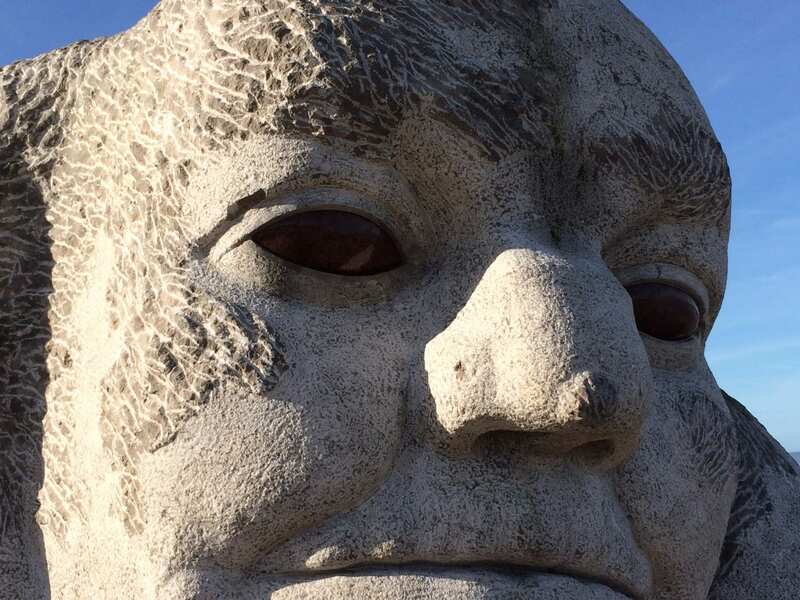 He was white when he was installed, and is frequently cleaned. But because he spends a lot of time under the water he quickly goes green and then blends in with the rock groyne – so look closely! 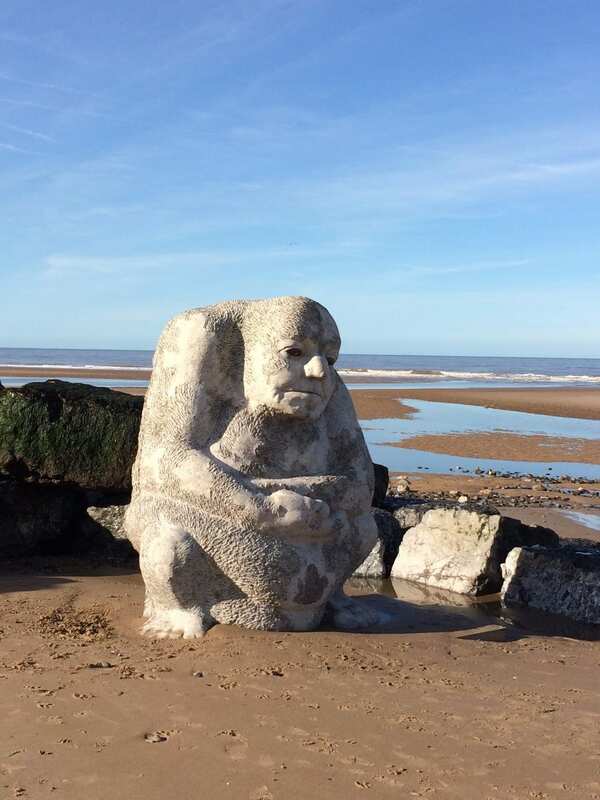 The Stone Ogre on Cleveleys Beach – under the water twice a day! As the tide comes in the Ogre retreats to his watery underworld. When the tide goes out, first the top of his head appears. Then his red eyes come out of the water, until his whole rotund body is exposed for you to look at, touch, explore and say hello to. 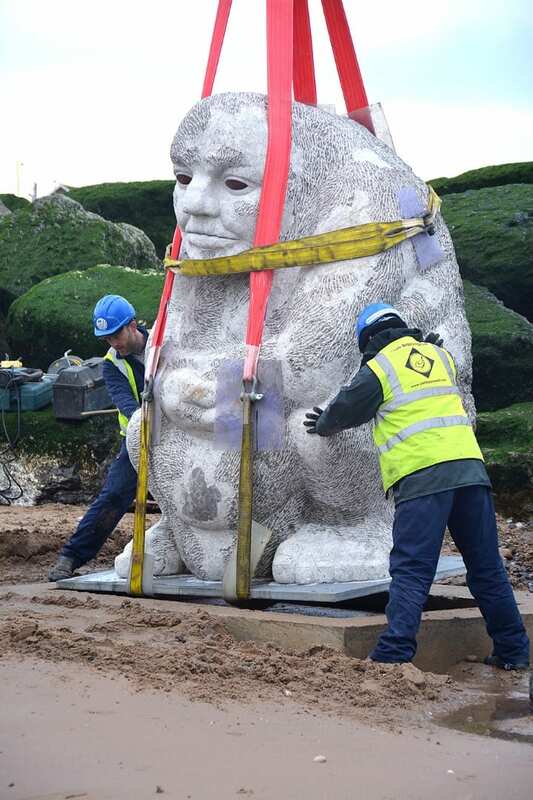 He’s not a small chap – carved in stone and 2.4 x 1.5m in size he’s a big lad! Monday 13th January 2014 dawned bright, crisp and sunny, although the weather was changing by lunchtime. The installation troops gathered as the tide went out – cheered on by a growing group of onlookers who watched from the promenade. 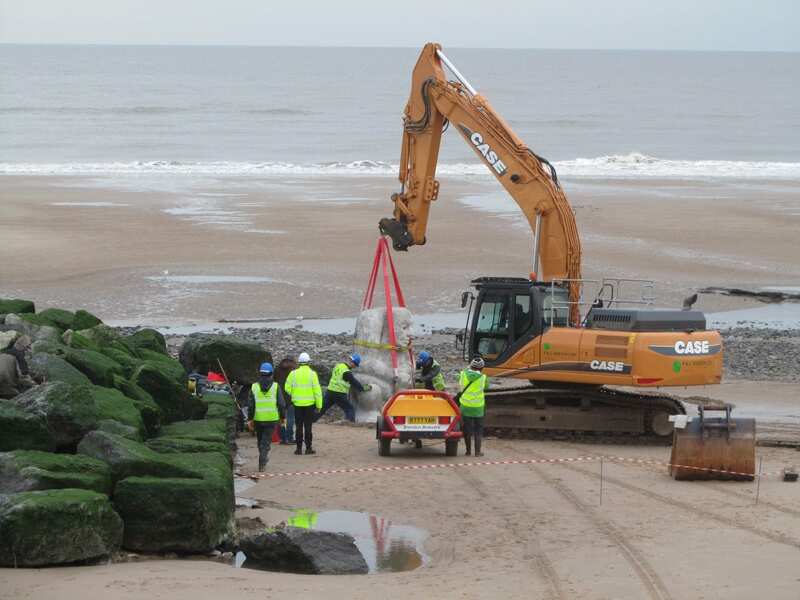 The JCB was first on the scene, followed by the Ogre laid flat on his trailer and delivered to site by a shiny blue tractor. 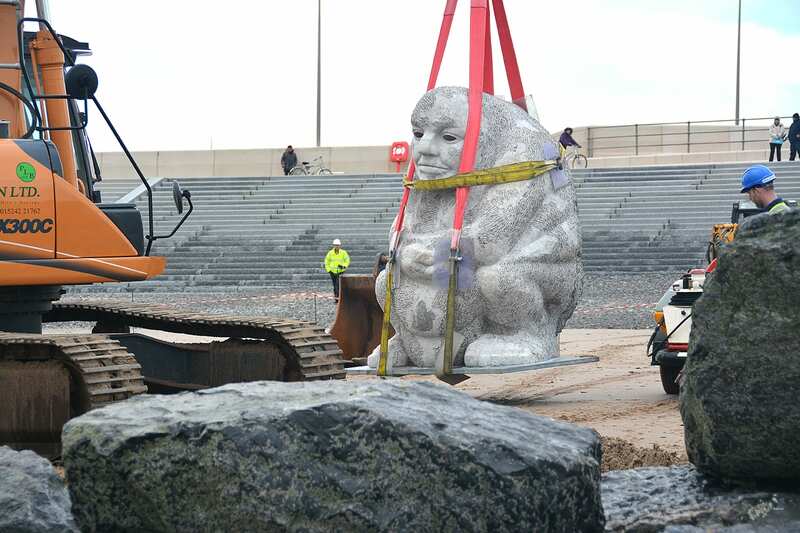 Not long later, after a bit of lifting and manoeuvring, our friendly Ogre was sat in his new home at the end of the groyne on the beach, facing the promenade between the cafe and the cinema. 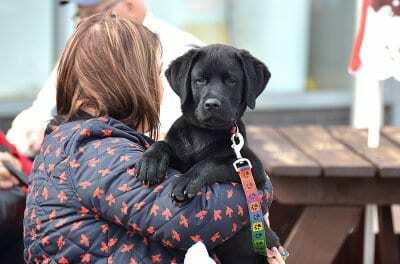 Don’t forget to send your photos in to share on the Visit Cleveleys Facebook page!